The purpose of this article is to describe medical hypno-therapy and the role it plays in the management of the pain patient. The author presents three case studies discussing the beneficial effects of hypnotherapy on generalized body pain, as well as two children with RSD. Much research shows the positive effects of using hypnotism for acute and chronic pain reduction and management. Hypnosis is the practice of approaching the subconscious mind with simple but powerful positive suggestions and images for changes that the client desires and deserves. When using hypnosis for pain management we remind the client that “pain isn’t pain until the brain translates it as pain.” Another way to say that is “change the mind, change the brain, change the pain.” So we help clients use the power of their minds to reduce “discomfort” and increase “comfort,” words we use instead of saying the word “pain” to avoid bringing the latter to mind and perhaps focusing on it, thus increasing it. This article will explain what hypnotism really is, and will give some case studies showing its effectiveness for chronic pain reduction and management to encourage you to consider adding this modality, along with Prolotherapy, with your chronic pain patients. Hypnosis is helpful for somatic and visceral nociceptive pain, neuropathic pain and psychogenic pain. There is much confusion about what hypnosis really is. Hypnotism was approved by the AMA in 1958. Because of its long history, it is considered traditional medicine rather than alternative medicine. Current JCAHO/NIH standards require hospitals to offer non-pharmacological management for pain. Hypnosis is an appropriate way to meet this standard. Hypnosis is often used in medical environments under the name of “guided imagery,” since that phrase doesn’t carry the baggage that the word hypnosis has wrongly acquired. There are several titles for practitioners, depending on state laws. Some call themselves hypnotherapists, or consulting hypnotists or clinical hypnotherapists. Hypnotism is a certified profession, not a licensed one. So if the practitioner does not have a medical or therapeutic license, they have to get a medical referral to do medical work stating “referring client for hypnotherapy for pain management.” There are highly competent hypnotherapists from a variety of backgrounds. Insurance rarely pays for hypnotherapy so the client is instructed to pay at the time of service in many offices. They are always encouraged to submit the receipt to insurance. So what is hypnosis? Let me first explain what therapeutic hypnotism is not. It is not what you see portrayed on TV, movies, cartoons, and on stage where a hypnotist appears to have control over someone. This couldn’t be further from the truth. A hypnotist has no control over a client. In fact, all hypnosis is self-hypnosis. In the state of hypnosis the client is in control. The role of the hypnotherapist is to help the client get back into control. In the case of pain management, it is to reduce feelings of discomfort and allow feelings of comfort. In the session the hypnotherapist facilitates a deep state of relaxation where the client’s subconscious mind becomes available for positive suggestions for the change they desire. The hypnotherapist acts like a caring coach. The client will respond to suggestions that they are open to, because the majority of humans are suggestible. There are ways to check for suggestibility. Ask a client if they have ever followed a suggestion to see a certain movie, or go to a new restaurant. Ask the client if they have ever daydreamed, or gotten very involved in a good book or TV show. These are all accurate indications that a client can be hypnotized, along with possessing normal intelligence, having the ability to concentrate, and being willing to change. The state of hypnosis is a natural mind state in-between waking and sleeping. It is a time when the subconscious mind becomes available for new positive suggestions and images for desired change. Thought is powerful energy. One’s life flows in the direction of the most dominant thoughts. In the hypnotic state the client becomes highly responsive to suggestions for the positive changes they desire. It is very natural, available for clients to use, given to each of us by a Higher Source to help manifest health, joy, and positive changes in your life. It’s all good. Nothing bad can happen to you in this state. The reason hypnosis is so effective for improving health, and aiding in pain management, is that the subconscious mind controls the body’s millions of functions. It’s also the place where habits and emotions live, and where the invisible walls of resistance can reside. Pain becomes a bad habit that can be unlearned in most cases. Some clients can have secondary gain with their pain. This will be discussed later. Each person uses various mind states every day, described by a number representing the number of cycles per second (Hertz, Hz) that their brain is moving at in that state. You are familiar with all of them. The state of hypnosis involves the Alpha and Theta states. Everyone is familiar with these states because we flow through the Alpha and Theta brain wave states each night as we fall asleep. We also drift into either or both of them when daydreaming, during meditation and prayer, when watching TV, when running or playing in the “zone.” It is an altered state of consciousness, just like sleep is an altered state of consciousness, but it’s not as deep as sleep. So it’s deeper, slower and more relaxed than being awake and alert (Beta) but less deep, less slow than sleep (Delta). It is natural, simple and normal and may be employed for every acute and chronic pain client. Yet, people have not been taught how to use this natural mind state. That is the role of a hypnotherapist, specially trained in medical uses of hypnotism. There are many styles of hypnotism. I use a common style of therapeutic hypnotism, using my trained voice and special licensed relaxing background music, along with encouraging the client to close their eyes, and coach them on the use of abdominal breathing to relax. I don’t use any visual objects, such as a watch, nor do I touch the client’s body. I don’t ask questions during sessions. The client has an easy job. After an intake where I gather pertinent and specific information on the client’s pain history and create rapport, I ask the client to sit back in a comfortable recliner. (See Figure 1.) When the client’s eyes are closed, I begin speaking in a relaxing voice. Some clients need extra time to begin to relax. Deep, rhythmic belly breathing and progressive/autogenic relaxation are important tools for each pain management client to learn. This alone begins to ease the pain. Then I shift to saying positive suggestions, adding in words and statements that they have chosen for their suggestions. Besides relaxation, which reduces cortisol, there are other hypnosis phenomena used to help clients. These are distraction, dissociation, time distortion, desensitization, direct and indirect suggestion, analgesia, glove anesthesia, total anesthesia, and post-hypnotic suggestion. We never override the brain’s ability to create pain in order to signal tissue damage. Hypnotherapy and EFT (Emotional Freedom Techniques, a waking hypnosis technique which uses tapping on acupressure points) are also effective ways to change underlying emotional issues with hypnotic approaches. Figure 1. A client (her husband, Marty Berg poses as a client) relaxes comfortably as Gina speaks to him, allowing him to enter trance. Note the biofeedback monitor on client’s left hand and graph being created on computer screen. Clients need not concentrate on the words. Many people hear all the words; for others the words drift away, but the suggestions still get in. Others get some “busy mind” but the suggestions still get in. If “busy mind” occurs, the client is instructed to simply bring their attention back to their breath, the words and the music. In the state of hypnosis, clients feel relaxed. Some people feel so relaxed that their arms and legs feel heavy. Others feel light and tingly. Some may experience time distortion, images, or some eyelid fluttering. Hypnosis is not being unconscious, in a coma, “out,” “under” or asleep. 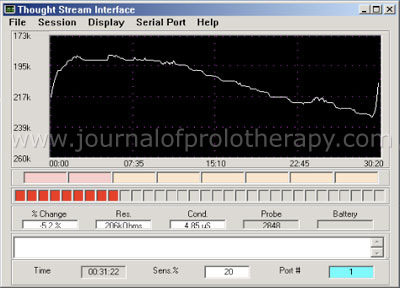 To track the level of relaxation which correlates with depth of hypnosis, I use a biofeedback monitor on the client’s left hand. It tracks galvanic skin response, measuring changes in the electrical conductivity of their skin. Moist skin conducts electricity better than dry skin. As the client relaxes, skin moisture content decreases and the electrical conductivity decreases as well—a highly accurate reflection of changes in their physiology. 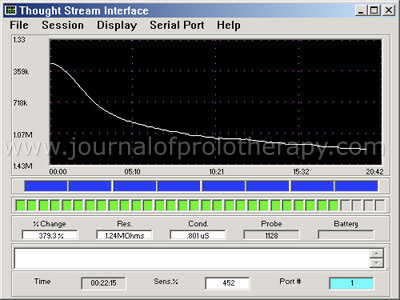 The biofeedback monitor is attached to my computer and creates a stress reduction curve which correlates to the six levels of hypnosis depth, with six being the deepest. (See Figures 2 & 3.) I get immediate feedback and the client receives this quantitative feedback at the end of the session. It is always fascinating to them. Figure 2. A classic, deep relaxation curve. The client went to a level 6 of hypnosis depth (the deepest). The time span of the session was 20 minutes. Figure 3. This client initially experienced some stress (upward curve) but then relaxed well and went to a level 2 of hypnosis depth. As the body relaxes, the brain waves will automatically slow down and the client drifts into a state of hypnosis. It is natural and very powerful. Some people drift lightly, some people enter a deep state, most are somewhere in the middle. With practice, most people can go deeper. The client always receives their recorded hypnosis session on a CD, which they use every day at home to increase their comfort, feel more relaxed, in control, sleep better and have a more positive attitude. As they use the CD every day, it also improves their self-hypnosis skills. Clients sign up for a series of sessions, with a three-session minimum. A 65 year-old woman, referred by a physician for pain control who described her pain as generalized body pain, especially back fatigue and pain in her knees. Even with Prolotherapy, she was on medications for pain, muscle relaxation and anxiety, including Vicodin, Norco 10/325, Soma 350 mg, and Klonapin 0.25 mg. Even with medications and Prolotherapy, this client’s pain often was at a 10, which totally disabled her. This client lives hundreds of miles away, so our initial intake was by phone. Upon hearing her story of a series of difficult diseases, conditions and falls, I could hear the deep sadness, trauma and grief of a woman who had lost the vibrant, loving, full life she once had. Upon getting breast cancer in 1990, with two mastectomies and breast reconstruction, her husband cut off from her in every way. This caused great emotional pain, shock, anger, sadness, resentment, betrayal and grief. When one of her implants leaked, her health was very impacted in many ways, with immune system problems and much pain. She spun downward and became disabled and was on full disability for years. She was very open for healing and felt “very excited and confident” of the hypnosis support. In our field, we acknowledge that emotions can lead to physical manifestations of illness and pain. Since I wasn’t going to see her for weeks, and wanted her to begin to get some support and relief, I recommended that she order two guided imagery CDs; one dealing with pain management and the other to begin healing the trauma and her broken heart. She ordered both and listened to each one every day. These pre-recorded sessions are helpful. I also create such CDs and make them available to my clients for purchase. These guided imagery sessions began a healing process for her. She was a very dedicated, diligent client, with a deep desire to regain some sense of her former self, and feel more comfortable and in control of her body. She was determined to get off pain medications, even though her physician wondered if that were possible. We had six sessions over a 3½ month period. She scheduled with me each time she was in town for her Prolotherapy sessions with her physician. She steadily improved with these interventions of hypnosis, (including some classic relaxation and breath techniques, Ericksonian approaches, imagery, desensitization, sleep improvement, ego strengthening, healthy boundary setting and problem solving), EFT, and Prolotherapy. The Prolotherapy alone, for this client, helped her, but didn’t allow her to be free of the pain medications, or long bouts of intense pain. After the second session, her pain was down to 5-6. It was in this second session that I sensed she was in an abusive relationship with her husband. The hypnosis session dealt with creating healthy boundaries. We talked of options, resources, and a book she could read. She read the book, which helped her gain a lot of strength and a firm reality check. Her pain reduced substantially after that. She regained some of her power and created more safe and healthy boundaries for herself. She was getting herself back. You may be wondering what part of the recovery could be attributed to the Prolotherapy, the hypnotherapy, the EFT, the caring support. Remember, with Prolotherapy alone, this client didn’t get complete relief. Yet, in a holistic approach, we often have to use several modalities to deal with the complexity of a client’s issues. That’s the challenge and gift of the holistic field. We deal with the complex terrain of mind, body, energy, emotions and spirit. Both of these clients were children with RSD. They had very different outcomes with hypnosis support. Both had secondary gain with their condition, which allowed them to have special time with Mom and stay out of school. Client #2 was a 13-year-old girl in 7th grade. She came to see me seven months after a broken arm had healed. Her pain remained. She stated the pain was pretty static at an 8. She could not attend school, so her mother, a nurse, did extraordinary things to be home and present for her youngest daughter. They had a very close relationship. They tried physical therapy and counseling, and then decided on hypnotherapy. The mother stayed with us in the sessions (I have since changed my policy on this). Some traditional hypnotherapy approaches were used to support this client to increase her comfort, and EFT (Emotional Freedom Techniques) was also used. The client did not experience any shift in her discomfort. Yet she and her mother felt encouraged to continue. In the sixth session the issue of secondary gain was explained and she began to get hypnotic support for this common component of chronic disorders. I began to suspect that Mom also had some secondary gain in this situation, which forced her to have some special alone time with her youngest child. This was discussed. In the eighth session, I asked the Mom to wait in the waiting room. I continued to work with the client on the secondary gain of having this special time with Mom, and that if her pain improved, she’d have to lose this special time and go back to school. Her discomfort did not improve, and with the separating of Mom and daughter, this client did not return. I share this case study to remind that a client needs to want the result in order for it to happen. Secondary gain is very common in all chronic conditions. Client #3: This girl was a precocious 9-year-old in 4th grade. She had a broken ankle which had healed six months earlier. The pain remained and she was diagnosed with RSD. She also couldn’t go to school. Her pain ranged from 5-10. Her mother also did extraordinary things to be present for her oldest daughter and stay home with her. She had a tutor during this time. Her younger sister was in school, so she also had some very special time with Mom. She did miss school, her friends, and she had a major part in their musical The Wizard of Oz, and was concerned that she wouldn’t be able to perform. So she had some motivation to get better. She responded beautifully in the first session to classic hypnotherapy and EFT. We discussed the concept of secondary gain. “Could it be that even though you really hate having this ankle pain, that you do get a benefit by having some special alone time with Mom?” She said, “Of course! I get to have Mom all to myself. My life ended the day my little sister was born!” I couldn’t help but smile at her clarity and honesty. “Do you think you can come up with some ways that you and your Mom could have special time together during the week when you get better and can go back to school?” She had an immediate and creative list of things she could do with her Mom, including a weekly time to go out and have lunch or tea together. I asked her to write them down, and discuss them with her mother. She did, and Mom agreed. In between her first and second session, she listened to her hypnosis CD and used the EFT technique; her discomfort fell to zero. She went back to school, practiced in the musical, and enjoyed new and healthy ways to have special time with Mom. She was a hit in her musical. Her pain never returned. People said it was a miracle. The miracle is that the mind is powerful. Children can respond so quickly to hypnotherapy and EFT. They use creative problem solving well, too. There are many resources to learn more about hypnotherapy and pain management. A classic text book is Hypnotic Suggestions and Metaphors edited by D. Corydon Hammond, Ph.D., an American Society of Clinical Hypnosis Book, W.W. Norton & Company, New York, 1990. There is a whole section dedicated to pain management. You can easily search the Internet and find a wealth of articles and research in your favorite medical journals. Often, medical journals in other countries are more open to this research. If you wish to train to become a hypnotherapist, you may study with the National Guild of Hypnotists program, or with the American Society of Clinical Hypnosis. You can offer your pain patients pre-recorded pain management CDs as an easy way to introduce this modality. Please contact me for this information. Private clients and sessions by phone are also available.